Visatone Island Pictures. 1962. Director: Andrew Steane. Music: Peter Sculthorpe. 45 (ST) HMV. EA-4510. 1962. Harmonica played by Larry Adler. Side a: “Theme From “They Found A Cave”. (1:55). (Peter Sculthorpe). Larry Adler. Side b: “Journey’s End”. (1:50). (Peter Sculthorpe). Larry Adler. 45 (ST) Columbia. 7MA997. 1962. 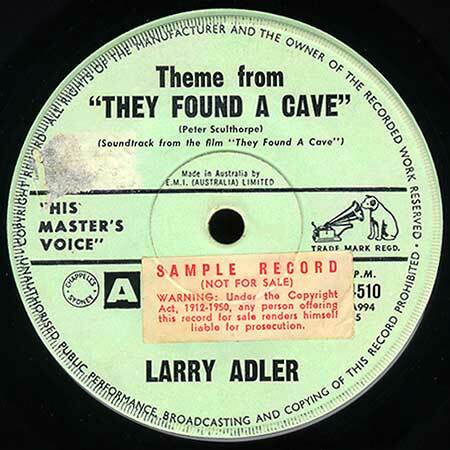 Side a: “Theme From - “They Found A Cave””. Harmonica - Larry Adler. Side b: “Journey’s End”. Harmonica - Larry Adler. “Left Bank Waltz - Theme”. Max Cooke piano. “Left Bank Waltz - Theme”. Peter Sculthorpe piano.